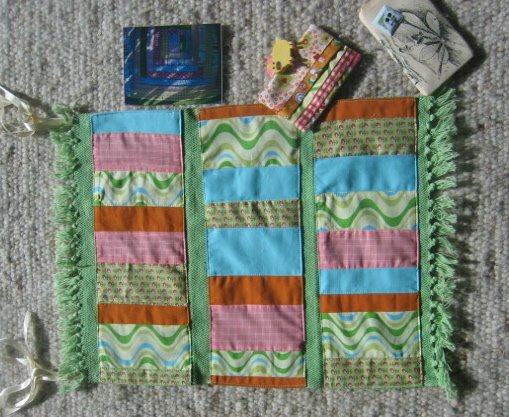 gentlytiptoe: WIP - learning to sew. 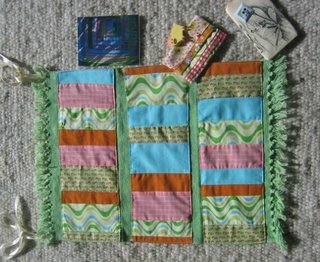 WIP - learning to sew. 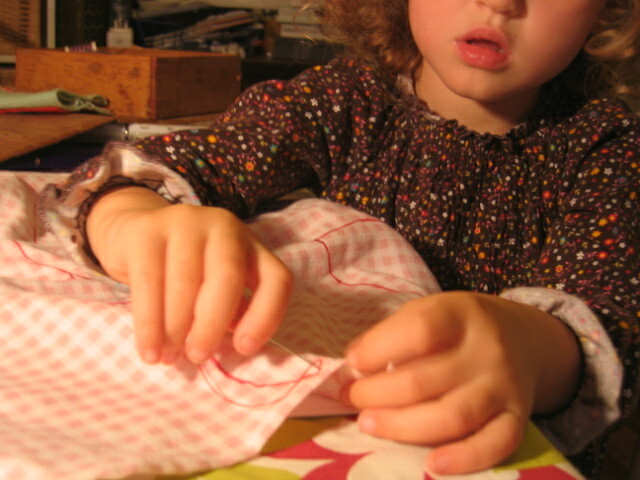 Esme has been wanting to learn to sew for a while now, as she sees me doing various projects. 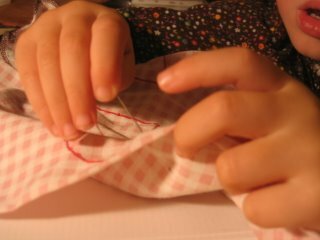 I was a little worried to let my 5 year old loose with a small sharp pointy needle, but yesterday she heard that her cousins were learning to sew and that was it. They were going to make Wees, and I thought this a good starting project, but when we went to Wee Wonderfuls to download the pattern, Esme wanted to make the bear from the pattern book instead, she follows after me and likes to jump straight in, rather than trying something basic first. Luckily I recently purchased a copy of the pattern book and it was sitting patiently here on the side waiting for me. I too like the bear best, I think Esme has fantastic taste. Anyway, I simplified the pattern by joining all the pattern pieces together, so she has one 2-D bear shape to sew around. This makes it probably as easy as the wees, just bigger. On a search for pink fabric I had the idea to use an old pillowcase, extra handy as the two pieces of fabric are held together as she sews, and we can cut around the shape when she is finished, flip it inside out and stuff, and voila!! Look at the concentration required. she also has plans to accessorise her bear with various hearts and so on. She has proved a natural, her stitches are pretty impressive I think and she only went wrong once when greatly distracted by her little brothers game on the computer!! So, today she has done more(despite having a friend round after school, she sewed regardless! ), and I think she will be done on the main bit of sewing if she does some more tomorrow. And she is so excited by it. I will keep you updated. Other news, I had fantastic post (again!!) today, a parcel from Mirre just because she is nice!!! look what she sent me. oops, I posted the photo on its side, well you get the idea, tilt your head left!! She sent a hanging pocket thingy (these have a name, what are they called?) 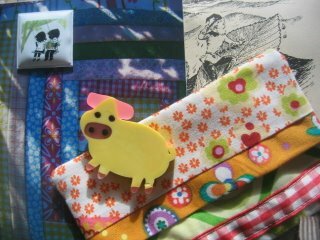 plus a tissue holder, and a rubber pig eraser (that Lucie wanted to swipe) and a tiny cute magnet, and one of her new postcards. What a lovely surprise when I walked in from this mornings school run. And it fitted through our supersized letterbox, so no visiting the depot to collect today yay! The littlest bits were cutely wrapped in a page from a vintage childrens book, ripped out (gasp-naughty!). Lucky me. I have hung the wall pocket hangy thingy at the bottom of my stairs for now, so I can put bits in that need to go up. the colours go best in my kitchen so I might need to go look for some wall fixings for it in the screws box. Love all the fabrics she picked, and especially for the tissue packet, which I have stuffed with Cath Kidston tissues (that match, should have taken another pic) and popped in my baby bag, they will go everywhere with us. Thankyou Mirre, you are fab! Can't wait to see her finished bear...I love the bear too, first thing I made from the book! Artie is now my munchkin's travel bear. I think "wall pocket" is a perfect name and what a treat to have a daughter that wants to follow in your footsteps. Lovely Hannah! hooray for little fingers learning to sew.. and thanks for the nice comment on whip up about bella. i will tell grace! she needs to make another doll. How wonderful (no wee wonderful pun intended, okay perhaps a sight), I really like those photos, I bet she will too. 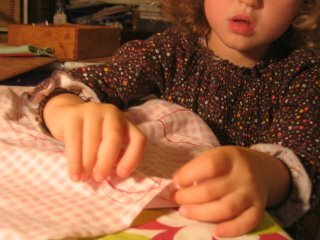 wonderful photos of her sewing. it is so fun to teach little kids how to do crafts. they always seem so intent on learning. i can not wait to see the end results. Ahh, bless her, she looks like she is really concentrating, how fantastic that she is interested and got to choose her own pattern and everything, lets hope it's the beginning of a long term love affair with crafting. stand still and I'll stick ya!